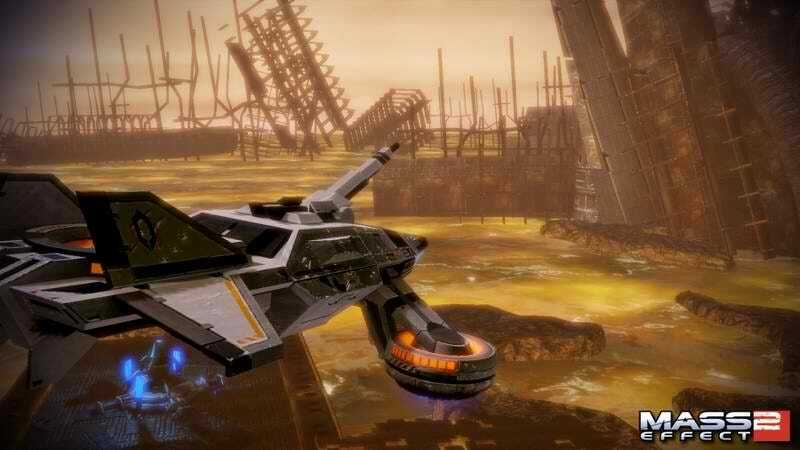 Mass Effect 2's "Firewalker", the fourth piece of downloadable content for BioWare's excellent sci-fi role-playing game, is the first to give you a bonafide land vehicle to play with. And it's a tank, no less. The entire DLC revolves around the fate of the crew of a missing survey ship. You and your merry band of intergalactic guns-for-hire are tasked with tracking them down, and to aide you, you're given a tank. A hovertank. As you'd expect, the search takes a back seat to driving around blowing stuff up in said tank. Question is, is that as fun as it sounds? Handles Well - The M-44 Hammerhead tank is not the Mako from Mass Effect 1. For starters, it doesn't have wheels, but more importantly, it actually handles well, steering smooth and the jump thrusters easy to handle. In short, the Hammerhead is fun to drive around, and since that's what you're doing for most of this DLC, that's a good thing. Proof Of Concept - Know what I liked most about the M-44? The fact that the whole time you're playing this DLC, you feel like you're part of a focus test, seeing what works about the tank and what doesn't so that the concept can make a comeback for Mass Effect 3. I liked the idea of vehicular sections in Mass Effect, if not their execution, so it'll be nice if this DLC leads to their triumphant return in the third game in the series. Hope You Like Driving - It's unfair to hate something that's free (well, free for most), but on the off chance you're paying for this DLC, then you should know there's not much to it beyond the tank. There are five missions to go through, but each is short (you'll be finished all of them in under an hour), and moments you spend outside your tank are rare. So don't expect much running around, and don't expect much of the game's hallmark chit-chat, either. Considering you get five new missions, a few new star systems and an entire new gameplay element (driving) to play around with, Firewalker is a great piece of downloadable content, particularly since it's free for anyone already in possession of the Cerberus Network. Hopefully the success of the M-44 leads BioWare to do more with it than the short, sharp missions on offer here. Firewalker was developed by BioWare as a downloadable content expansion for Mass Effect 2. Released on March 23 for Xbox 360 and PC, free for Cerberus Network subscribers (Cerberus costs $15 if not). Played all new missions to completion, mined the crap out of all new planets.